All transactions are safe and secure with a reliable history in online purchasing behind each of our associates. 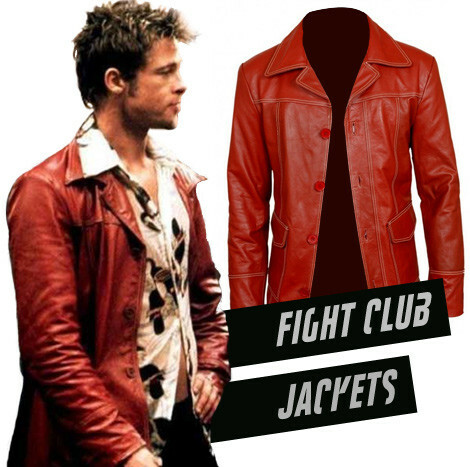 Buy the Tyler Durden Red Leather Jacket | Brad Pitt Fight Club Costume to own Fight Club clothing and merchandise. This red Fight Club leather jacket is more than just a key element to any Tyler Durden costume. It's a replica jacket that was designed to look just like the one that Brad Pitt wears in the movie. The button-up coat features genuine leather that is soft and light on the body. It's the perfect coat to incorporate into your wardrobe or to wear as a Fight Club Halloween costume. Tyler Durden would welcome you into his soap business with open arms. Maybe you can hand it out to trick-or-treaters for Halloween. In addition to the Tyler Durden Red Leather Jacket | Brad Pitt Fight Club Costume above, browse the Fight Club Clothing Gallery for more apparel like men's and women's clothes, kids shirts or hoodies.